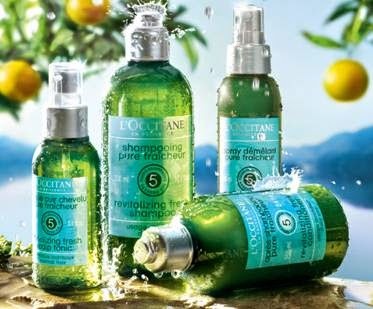 L'Occitane Revitalizing Fresh Hair Care - a breath of fresh air for your hair! L'Occitane Revitalizing Fresh Hair Care - combines the revitalizing properties of five essential oils: peppermint, grapefruit, thyme, lavender and cedar with the purifying power of a plant-based vinegar in an ultra-fresh, silicone-free formula that helps to revitalize and purify normal to oily scalps and eliminate built-up residue that suffocates the hair and keeps products from working effectively - for hair that feels revived, light and energized! Revitalizing Fresh Shampoo - 300ml - $22 - refreshes and helps revitalize the scalp to keep hair feeling squeaky clean. Revitalizing Fresh Conditioner - 250ml - $22 - gently detangles and leaves hair feeling soft and light. Revitalizing Fresh Detangling Spray - 125ml - $26 - helps with detangling and styling and revives hair without weighing it down to leave hair supple, shiny and easy to style. Revitalizing Fresh Scalp Tonic - 100ml - $28 - immediately refreshes and helps purify the scalp by reducing excess sebum. Not only are the purifying essential oils good for your hair, they make the products smell amazing - and are a great pick-me-up in the shower!